Customer reviews are the single most effective bit of marketing you can do for your company. Now more than ever, online reviews and ratings can impact your business. 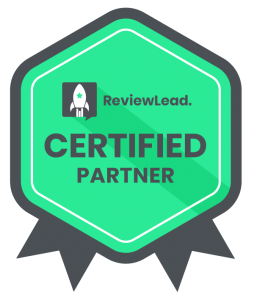 As a certified partner with ReviewLead (the most comprehensive review management service available today), we work to bring in good reviews and minimize bad ones so that you’re putting your best foot forward. Acquire customer reviews easily and quickly, and gather them in one place with our simple process. We optimize the process with Google, Facebook and the industry-specific sites that matter to you. Share the latest and greatest positive reviews through several different channels. Stream the compelling reviews to your website and on your social media to drive visibility! Most business owners are far too busy to keep tabs on all of the various review sites and even if they could they wouldn’t check it frequently enough to take appropriate action. With ReviewLead we monitor review sites for you so you’ll never miss a review again. Never stop getting new reviews because customers see reviews older than 3 months as irrelevant. Your great reputation deserves to be seen! Maximize exposure by automatically sharing your 5-Star reviews on Facebook or Twitter. And Get Valuable Client Feedback in Private. Protecting your reputation isn’t just about getting more positive reviews.